to LDS. Temple Mormon,Bern Switzerland ,9th. operating Temple. This 3D model was originally created with Sketchup 8 and then converted to all other 3D formats. Native format is .skp 3dsmax scene is 3ds Max 2016 version, rendered with Vray 3.00 Site: 7 acres. Exterior Finish: Reinforced concrete with a creamish gray terra cotta facing trimmed in white. 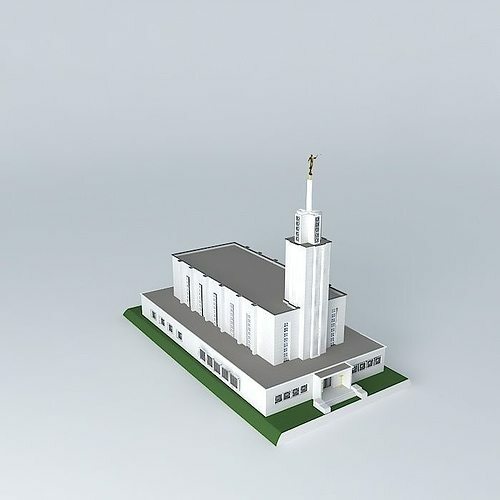 Temple Design: Modern-contemporary, single-spire design but similar to lines of early Church temples. Number of Rooms: Four ordinance rooms and seven sealing. Total Floor Area: 35,546 square feet. LDS. Temple Mormon,Bern Switzerland ,9th. operating Temple.